TAC had eleven competitors in total, at the National under 15 and 17 championships, held at Bedford, over the weekend, eight of which were distance runners. Alfie Scopes won the under 15 Discus and gained bronze in the Shot Putt, which were TAC's only medals. However, many of our athletes were having their first taste of such an event. 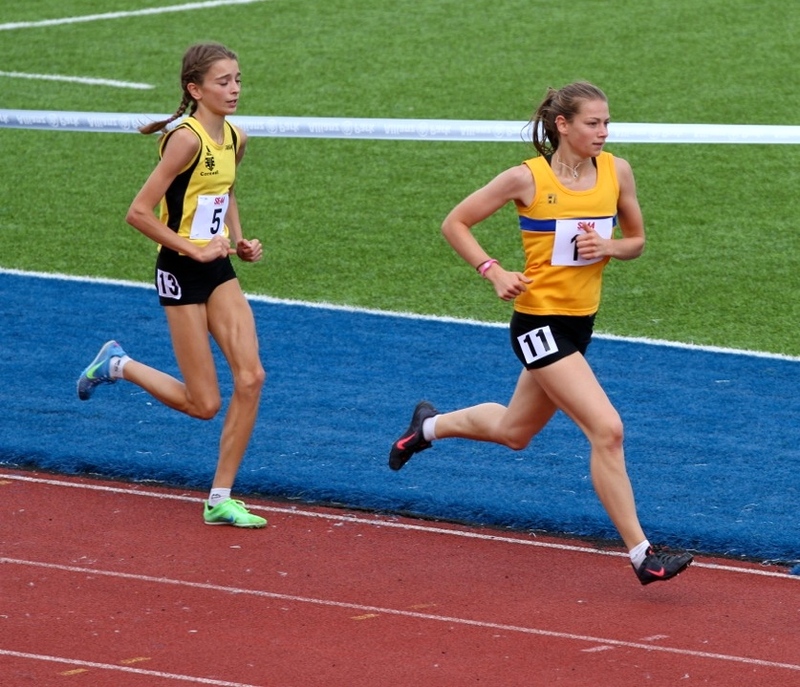 The top placed distance runner was Kathleen Faes, with 7th in the under 15, 1500m in 4.49.06, having qualified from Saturday's heats as the eleventh fastest of the twelve runners, in the final. Perhaps the best performance came from Alasdair Kinloch, who took five seconds from his personal best, in a high quality under 17 men's 3000 metres. Ally ran 8.43.56 to finish 8th, in a race won in 8.35. Polly Pitcairn-Knowles (9th in 5.31.20) and Hannah Czarnowski (13th in 5.43.28) both ran pbs in the under 17 women's 1500 metres steeplechase, which had seventeen finishers. Maybe the bravest run came from Bede Pitcairn-Knowles, who was 19th in the under 15 boys' 3000 metres, in a new pb of 9.54.60. Having gone through halfway in around 4.47, Bede was well inside his pb pace and with another Winter's training will surely take a lot more time off next year. 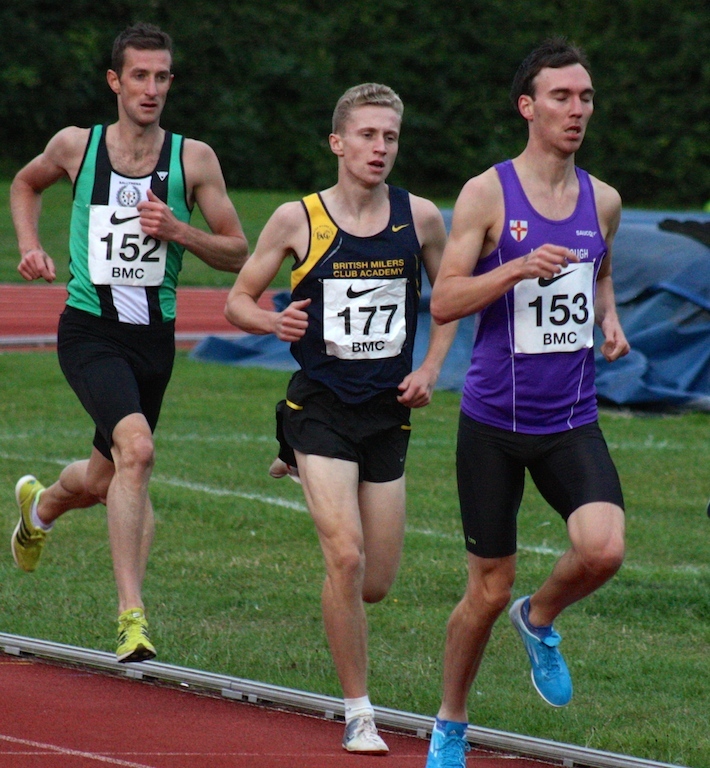 We had just two TAC distance runners in action at Watford, with Euan Nicholls running his first 1500 metres of the season and Charlie Joslin-Allen completing his first track race this Summer. Euan has focussed on the steeplechase in 2014, but ran 4.19.45 to shave a tenth of a second from his personal best, as he gets ready to go to the UK School Games in early September. There he will be representing the South East team. Charlie ran a well judged race, as he builds up his fitness towards the Winter season. He ran 8.32.49, which was three seconds away from a pb and placed him 7th in the fastest of the three races. He became the 16th TAC athlete to run under 9 minutes for 3000 metres, this season, which is a record number in one year. It is a measure of the club's progress that ten years ago, in 2005 we had no athlete under 9 minutes and the top 12 averaged 10.05. Today the top 12 have run between 8.16 and 8.41, with an average of 8.30. What's more is that the oldest of the twelve is Tom Cox at just 21 years old. It was a tough day for both volunteers helping and the athletes, with few personal bests being run in the very wet conditions. Michael Ellis (4.33.05) and Polly Pitcairn-Knowles (5.13.09) were the fastest male and female 1500 metre runners on show, whilst Alex Hookway (2.00.20) and Polly (2.28.78), back on the track, were the quickest at 800m. Dan Watt (9.25.20), won the 3000 metres, where in the same race John Harley ran 11.40.05 to set a new TAC club record in the over 60 age group. Kiri Marsh was the quickest female and was close to her pb with 11.53.14. 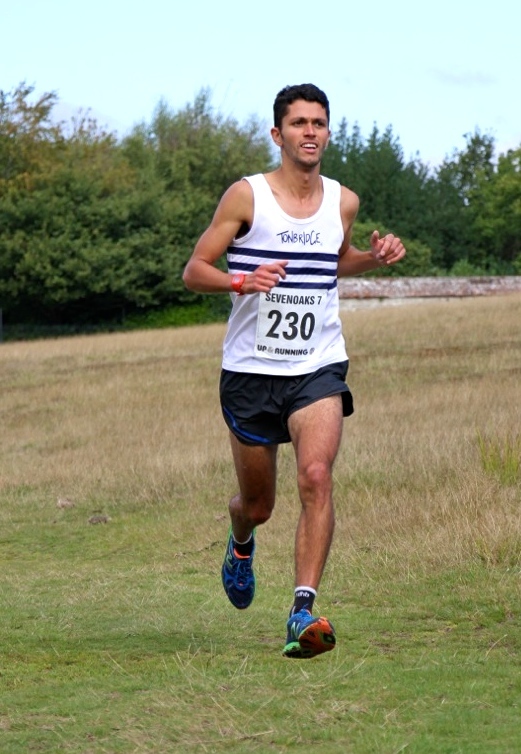 Greg Cole finished second in the Canterbury Half Marathon in 77.13, which was his debut over the distance. Winter season 2014/15 - preparation starts here ! I have emailed all the TAC distance runners since we need to start looking at availability for September events, prior to submitting entries. Please let me know at markhookway@aol.com should you wish to compete on 13th September in the Blackheath Relays and/or 20th/21st September South of England Road Relays. Details of all the Winter fixtures, including a guide, can be found under Race Information. Today's 5km Parkrun was a TAC 'takeover' in terms of the club supplying about twenty or so volunteers to help. This included marshals, timekeepers, pace runners and other roles. A big thank you goes to all of you who gave up some time. Our group of pacemakers did a great job and encouraged many runners home in pbs. Unfortunately this afternoon I was nominated by Henry Pearce, of TAC, to take the Ice Bucket Challenge. This involves donating to a charity such as ALS or completing the challenge within 24 hours. It involves pouring a full bucket of cold water and ice over yourself, filming the evidence and nominating others to take it on. I didn't want to dwell on this, particularly as it would have meant potentially finishing second to Robbie Farnham-Rose, so here is the proof it was completed ! Its beginning to feel a lot like the end of the Summer season, but there is still some action taking place and more to come. This was the last of the Eltham evening meetings for the season and featured five TAC distance runners, plus Tom Cox and Sean Molloy helping out with pace making duties. Dan Seagrove (u15) ran a 400 metres in 59.62, to improve his personal best by seven hundredths of a second, being the only TAC pb of the night. However, it was really good to see a couple of season's bests over 800 metres, with Alex Hookway winning the D race in 1.59.49 and Harry Paton running 2.03.69. Both are getting close again to their pbs. 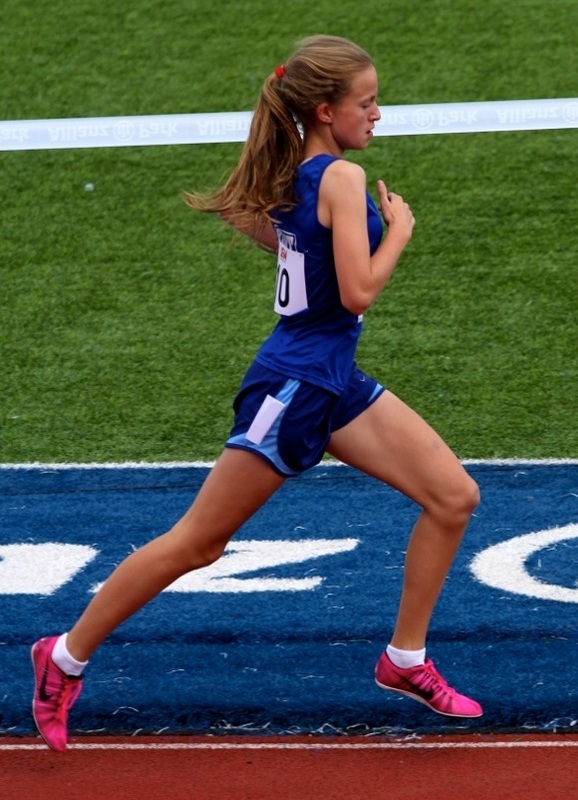 Hannah Czarnowski (u17) ran 2.24.01, which was not far away from her recent season's best and once again showed that she is a stronger athlete with a good finish. Christian Lee (u15) was the final athlete in action, running 2.09.27 in his 800m. Chris Cohen captured the second TAC middle distance title of the weekend, with a fine win in the under 17 men's 1500 metres, in 4.06.7. Full results are awaited. 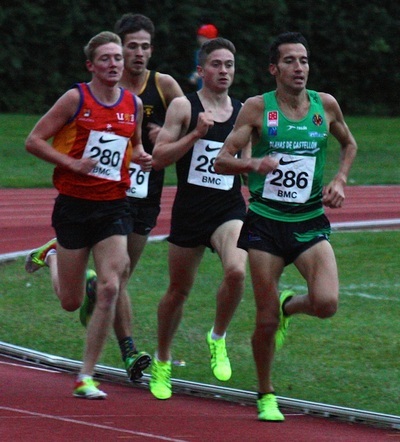 George Duggan finished his track season with a personal best over 1500 metres of 3.50.40, whilst Robbie Farnham-Rose ran 8.18.68 for second place in the 3000m, which was also a pb. Charlie Joslin-Allen (3000m) and Corey De'Ath (1500m) both had tough experiences in their races. 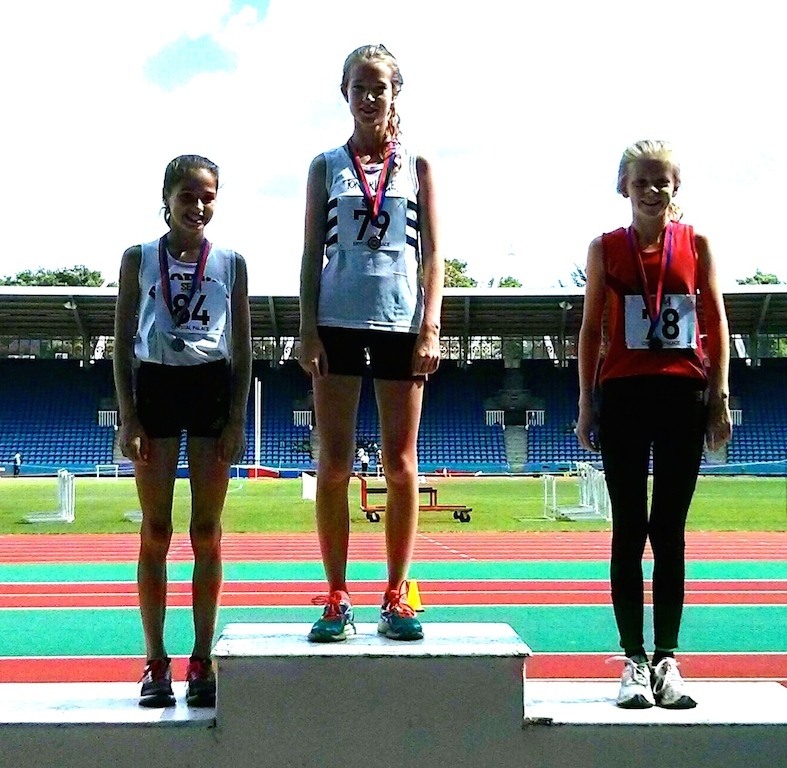 Kathleen Faes won the under 15 girls 1500 metres in fine style,in approximately 4.46.05. Christian Lee finished 6th in the under 15 boys 1500 metres in 4.31.56. Chris Cohen won his heat of the under 17 men's 1500 metres and qualified for what should be a very competitive final, on Sunday. Others competing included Ollie Dunn (u17, 1500m 4.50.22) and Ben Brooks (u15, 800m 2.32.91). Full results are on the Results 2014 page. Michael Ellis was 2nd at Tonbridge and Graeme Saker was the same at Maidstone. Henry Pearce, commencing a holiday in France, finished second in an 8km road race today, describing it as one of the hardest races that he has ever done, including steps to climb. He was beaten by a local who has run 3.48 and 8.16 this year for 1500m and 3000m. Henry ran 25.30, which is an excellent time if the course is an accurate one, since it is only approximately 50 metres short of 5 miles. Just five TAC athletes were in action at Watford, with just George Duggan and Hannah Czarnowski producing seasons best times. George finished second in the British Milers Club 800 metres mens B race in 1.52.65, which was his best this year and just eight hundredths of a second away from a personal best. Hannah ran in race seven of the open 800m races and continued her improvement over the last month, which has seen her get close again to her best form. She ran 2.22.42, improving her best this year by 0.6 seconds. Ryan Driscoll (3.57.23), James West (3.59.53) and Tom Cox (4.00.03) all ran in the BMC 1500 metre races, but could not find their best form on this occasion. Charlie Joslin-Allen had his first race since April, making his debut over 5 miles and winning this road race in 26.03. TAC's Dan Watt had set the early pace, as the two of them covered the first mile in 5.05 and went through two miles in 10.30. It was from this point that Charlie started to pull away. Dan finished second in 26.58, being just eight seconds outside his personal best, set last year, when he again placed second, on that occasion to Dom Brown. Charlie's time was a course record, with the event being in its seventh year of running. 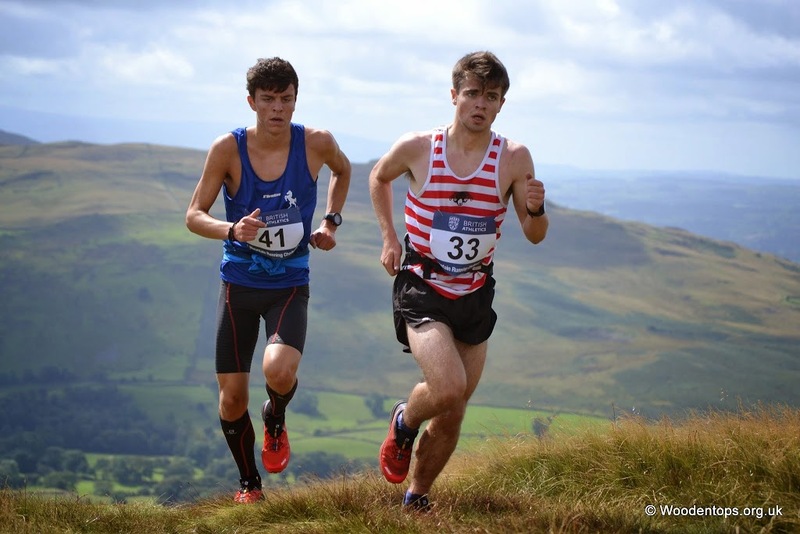 Max Nicholls has finished 2nd in the under 20 race at Sedburgh today, finishing 55 seconds behind the winner in 36.58. This was an uphill only race over 4.5 miles. His brother Euan finished 11th in 44.04. Max will now be selected for the World Championships, which take place in Italy on 14th September. Many thanks to Dave Woodhead, who provided the permission to use the photo below. Provisional track results are on the Results 2014 page. Tom Cox was the fastest 800m runner in action, with a win in 1.57.99, whilst Sean Molloy did likewise over 400m with 48.92, just outside his pb. There were a few still running personal and season's bests at the open meeting. A few examples of pbs came from Bede Pitcairn-Knowles (u15 800m 2.19.82), Jamie Brown (u17 400m 53.23), Jesse Magorrian (u15 400m 54.8), Lizzie Miller (u13 1500m 5.08.32). Special mentions for Imogen Ellis (u15 1500m 5.26.76) for a 22 second pb and Nicola Summerfield racing her first 800m since 2001 ! There was one club record set, by John Harley as a TAC over 60, 1500m record of 5.20.47. Brian Buckwell, in the same age category ran a seasons best of 2.32.21. More details to follow. John gained his Officials accreditation in the late 60s, when he was just 22 years old. Since then, he has worked tirelessly in a multitude of roles for not only his Clubs (above) but for their respective counties as well, not to mention regional and national officiating. Throughout his career, he has been a multi-discipline Official (starter, marksman, timekeeper, track judge, field judge) be it track & field during the summer and cross-country, road racing, sportshall and indoor track & field in the winter, and, even now in his retirement from his day job as a schoolteacher, he is still involved on an almost daily basis. He assists with the coaching of the younger athletes at Tonbridge AC on four evenings a week and attends fixtures on both days at the weeked. 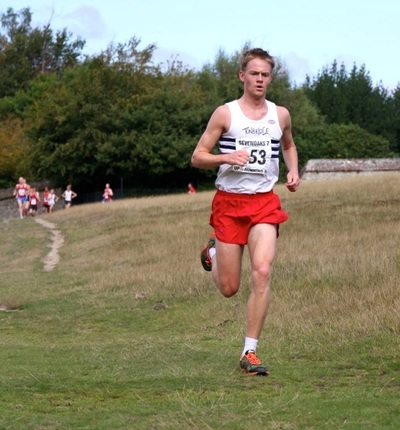 Course layout and management : John has created the excellent cross-country courses at The Schools at Somerhill which are used for Kent Cross-Country League fixtures (ref : Tony Durey) and for Schools fixtures, both on a local, county and regional basis. Almost single-handedly, he sets them up and also clears them down after each event. 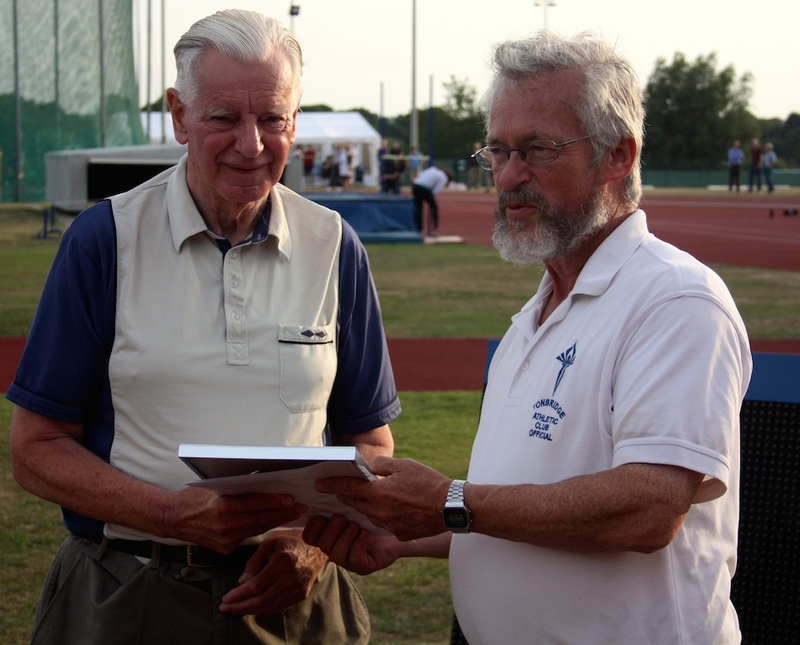 Equipment : John is the Equipment Secretary at Tonbridge AC and, in addition to sourcing the requirements, he maintains it all in excellent condition for the wide variety of open meetings and fixtures held at the track at Tonbridge School, with whom he maintains a very professional relationship. Child Welfare Officer : a crucial role for all organisations involved with youngsters, John has been a Child Protection Officer at Tonbridge AC ever since the relevant policy was introduced more than ten years ago. Sportshall : John is a staunch supporter of this concept and plays a wide variety of roles in its operation in Kent and with its regional teams. There is little doubt that John Sanders is one of those 'unsung heroes' without whom most sports would not survive. First and foremost he is a supporter of athletics and it is a mystery as to why he has not been nominated for and received an accolade to acknowledge his contribution. He would be more than worthy of a 40 year SEAA Long Service Award. Nicole Taylor, representing Sussex, finished third in the 1500m with a new personal best of 4.36.06. Kathleen Faes finished 4th in the under 15 girls 1500m in 4.50.09 and Michael Ellis was also 4th in the under 20 men's 2000m steeplechase in 6.35.90, just outside his pb. Photos courtesy of Richard Owen. Tonbridge won the match and are promoted back to the top division. Personal bests were very hard to come by in the windy conditions, but it was good to see Nicola Summerfield win the 3000m in 11.42.5, which is her best for many years. Hannah Czarnowski also ran a 1500m steeplechase pb of 5.43.7, whilst Ben Murphy did likewise in the 1500m. There were men's A-string wins for Sean Molloy (400m), Tom Cox (1500m), Ben Cole (5000m) and Michael Ellis (2000m steeplechase). On the women's side Becky O'Hara (400m) and Sian Driscoll (800m) were the TAC distance runners who won. Full results are on the Results 2014 page. Some of the photos below courtesy of Yon Marsh. Toby Ralph was first home at the Royal Tunbridge Wells Parkrun in 18.41, making his debut in the event.